Synopsis: Fourteen-year-old Cosmo Hill longs to escape from the Clarissa Frayne Institute for Parentally Challenged Boys. When a rare chance to get away comes, he grabs it, but the attempt goes fatally wrong. He can feel his life force ebbing away, sucked out of him by a strange blue Parasite … until a wisecracking gang of kids burst in, blast the creature and save him. They are the Supernaturalists, dedicated to ridding the world of these life-sucking blue parasites. When they realise that Cosmo has the ability to see these blue creatures too, they enlist him as one of them. Their mission leads Cosmo into a world of high-level corruption, James Bond type technology, thrilling adventure and finally back to a place that Cosmo ever thought he'd have to return...the dreaded Clarissa Frayne. 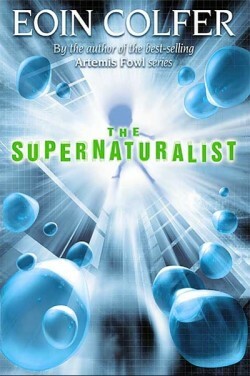 The Supernaturalist is Eoin Colfer’s first stand alone novel while writing the Artemis Fowl series. While it does hold certain similarities with Artemis Fowl, it is quite different.Despite the distinctness, it still manages to appeal to the same audience. Set in the future, it tells the story of four super-humans as they try and destroy a species that only they can see, a species that drains life from humans. The situation itself is quite intriguing: I remember reading it a couple of years ago, and being immediately hooked by its sci-fi pretence. Eoin Colfer has successfully managed to create a realistic future, full of gadgets and tech. In this respect, it is quite similar to Artemis Fowl; both are stuffed full of hi-tech gadget wizardry. The whole setting is based upon a slightly dystopian, industrial and gadget-bloated future. I found it quite similar to the setting in Garth Nix’s Shade’s Children, which also deals with odd creatures and a dystopian future. The story itself is action packed. I don’t remember ever reading a quiet moment where I got bored, because the pace was actually surprisingly good. And where the pace did slow slightly in-between the chunks of action, the story made up for this. Colfer’s writing style lends itself quite nicely to these sorts of books; easily read, descriptive and concise. No overbearing descriptions of how Cosmo’s suit was made from the finest silk interwoven with teflon and tiny diamond encrusted pins in the lapels, no sir. The descriptions were just fine: enough to give us an idea, but not too much so it slowed the whole story to a snails pace. In conclusion, The Supernaturalist is a solid novel from Eoin Colfer that will be enjoyed by a great many people. Fans of Artemis Fowl will enjoy the similarities it holds with Artemis Fowl, but also love its many differences. This is a great, easy read for anyone over the age of nine, and it’s quite a loveable book.